Teaching the Qualities of Writing (TQW) is a ready-to-use writing curriculum that provides you with the instruction students need to improve the quality of their writing and at the same time develops your ability to read and assess your students’ writing. These hands-on lessons explore the qualities of writing—ideas, design, language, presentation—and show how, when each is infused with voice, the writer’s personality energizes the writing. 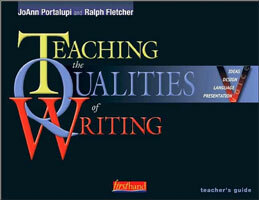 While Lessons for the Writers Notebook will support any writing curriculum, it is ideally suited to reinforce and extend Portalupi and Fletcher’s Teaching the Qualities of Writing (TQW). Mirroring the approach and three-part lesson structure of TQW’s ready-to-use lessons, the Lessons for the Writer’s Notebook offers an alternative launch cycle for introducing your TQW curriculum. Together, Notebook and TQW will improve the quality of your students’ writing while it develops your ability to read and assess their work.